The Sonics ask for a space of roughly 5x3 metres, but can work with a minimum of 4x2 metres if it’s a bit more of a squeeze. We will make the most of any space at our disposal, as we aim to fill your venue of any size with our presence. The Sonics are here to make the entertainment part of your evening run as smoothly as possible. We offer at no extra cost the option to have ‘Chillout’ or Background music played as your guests arrive. • From our experience, the best timings for Wedding performances would be, 7.30pm-12am with 2 x 60 minute sets. • Please plan sets around the evening food. Do not have the band start at the same time the food/buffet is due to come out as guests usually like to eat in peace and you will not be making the most of having a live band. • It is always recommended to go with 2 x 60 minutes sets opposed to the 3 x 40 minutes. We are happy for you to pick a few songs from our repertoire you’d really like to hear but we do like to decide the order in which they are played. It is usually best to say which songs you DO or DON’T want rather than a specific tailored set list. Depending on the reaction the crowd is giving us we may add or remove songs at our discression, if we find a particular style or era of music is going down especially well. We are based in Brighton just south of London but we travel all over the UK & Ireland and internationally. We are exclusively a function band so we don’t take on many public gigs but during quiet periods out of wedding season we may take on any short notice public shows. You can find us on Facebook under “The Sonics - U.K” any pub, bar or event gigs we do take on will be listed there. We do offer this as a service for a small extra fee. At the time of booking us, just please let your agent know if there’s a particular song you’d like us to learn so we have enough time to arrange it to the best of our abilities and decide if it works dynamically with the band. Any footage of the band is a direct and accurate reflection. We also accept enquiries via our Facebook page, where we will be happy to talk through your event in person. With access to thousands of songs, including classics and all the latest chart hits we make sure guests of all ages are dancing the night away in between sets. Music playlists between live sets come as standard with every booking, but if you want a more bespoke DJ service, we do offer a DJ package upgrade option where one of the band members will man the sound system all night, including any requests. This service is offered free of charge if you book us within 7 days of recieving our quote! Absolutely, If you give us an idea of artists and genres you prefer, we can cater to your musical tastes. If you would like particular songs played at specific times during the evening, please provide the music via one of the above methods along with a plan/schedule of your evening. You are welcome to use our PA system for your speeches. However, we don’t use radio mics (wireless) in our live setup so, should you need them, you will have to hire them in advance. The Sonics sound system is a specially selected brand new state of the art QSC system, including a Yamaha 16 channel mixing desk and speakers with over 2000 watts of active power and crystal clear clarity. The Sonics come with a lightning rig as part of our standard package. We usually play two one hour sets. This can be divided into three 40 minute sets if preferred. We also offer an acoustic upgrade option which consists of 2 x 30 minutes of carefully selected acoustic songs, perfect for during your meal or drinks reception. We can provide this service as an acoustic duo (Vocals and Acoustic Guitar) or as a 4 piece 'live lounge' style (Vocals, Acoustic Guitar, Bass and Percussion). We usually start our first set between 8 & 8.30 and play our second set in the final hour of the evening but this is entirely flexible. Arrival and finish times are 5pm and 12am (Midnight) as standard with early arrival and late finish fees applicable outside of these timings. Assuming access to the venue is straight forward (i.e. ground floor room with no steps and vehicle access close to the venue), once all of our equipment is loaded in we can normally be set up and sound checked within 90 minutes. Unfortunately, we don’t take provisional bookings, as we would be turning clients away on typically popular dates. However, when you make an official enquiry with us, your enquiry will be logged in our system and you will be given first refusal on your date should anybody else enquire for the same date. We take all bookings very seriously and are 100% committed to all of our clients. 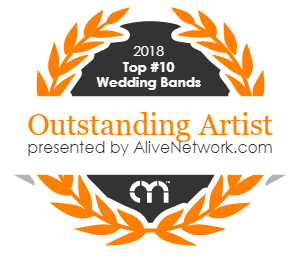 In the hugely unlikely event that a member has left or the band split up before your party, every effort would be made to find a suitable replacement band or musician. Its always great fun to welcome a guest on stage and we are more than happy to do so but we do like to know those singing or playing with us have some experience on stage. So we only ask that you arrange this with us in advance as past experience has shown that impromptu performances can be a bit of a disaster and we try to avoid a drunken karaoke situation! We carry up to date PAT certification and have Public Liability Insurance cover up to £10M. Why should I book The Sonics? The Sonics have carefully constructed their set lists to avoid playing those tedious or boring cliché covers band songs we all dread! Catering to clients of all ages, The Sonics keep it fresh, original, exciting and fun. Our members are talented, professional, enthusiastic and well-rehearsed musicians who have played all over the world at venues of all sizes to crowds as small as 20 to well over 20,000 people. You should book The Sonics if you want something cool, contemporary and a bit different and if you don’t, somebody else will! Yes. We have testimonials from satisfied clients on our website. Do The Sonics have any specific requirements? We only request a dressing room in which to change and something to eat and drink for the duration of our time at the venue. Our members have played in all types of venue, from Arenas to Chapels, Marquees and ballrooms to small clubs and pubs. No gig is too big or small for The Sonics. We want our clients to really feel as though they are at a gig when they're on the dance floor but we do bear in mind that people will still want to talk. During sound check we will insure that the optimum volume is achieved making it possible to talk whilst still enjoying the music and losing yourself on the dance floor. Due to the nature of the music we play and the fact we have live drums and guitars it means that we can only turn down so far. If your chosen venue has a dB limiter, please discuss this with your agent at the time of your enquiry - There’s every chance that we (or one of our fellow agency bands) have performed at the venue before, but if not, it’s worth discussing to make sure that the performance you will receive from us will not be compromised due to having to turn everything down so quietly to avoid power cuts. If your venues decibel limit is especially low, we are more than happy to provide an acoustic version of our performance, which, while obviously being quieter, will still provide you with music that’s you can dance to. We usually request 2 double 13 amp supplies near to the stage area. We use LED lighting, which keeps our power consumption down, but prefer to run lights from one power source and audio equipment from another to reduce the risk of noise interference. Do The Sonics offer any additional services? The Sonics offer a number of additional services at competitive rates: From ceremony music, acoustic sets during dinner, additional/extended DJ service, Microphone hire and live song requests. If you would like more information regarding the above options please contact us via email to discuss.